Do you sleep soundly through the night, or do you often find yourself staring at the ceiling wishing you could be staring at the back of your eyelids? Whether you sleep alone or bunk with a partner, child, or fluffy friend, the company you keep at night could impact your sleep quality. We collected Fitbit data from 30 people – 10 who slept alone, 10 with a partner, and 10 with a pet – to analyze how often they wake during the night. We also surveyed 2,000 Americans. We learned where they’re sleeping, who they’re sleeping with, and how much rest they’re getting. Are you snoozing just to lose sleep, or are you sleeping like a baby with your baby? Keep reading to compare your sleep stats with others. Do Sleeping Buddies Affect How Long You Sleep? 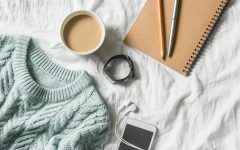 According to the Fitbit data collected, our participants – whether sleeping alone, with a partner, or with a pet – averaged around 6 hours and 27 minutes of sleep each night. Those who slept with a partner, however, caught a few more minutes, averaging 6 hours and 31 minutes per night. Participants who shared a bed with their fluffy friends averaged 6 hours and 27 minutes of sleep a night, while those who preferred to snooze solo averaged the least amount of sleep (6 hours and 24 minutes). 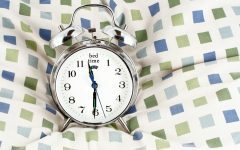 How Often Do Americans Wake at Night? People across America are being robbed every night – of precious rest. Who is to blame for this snoozing shortage? It turns out, man’s furry companion is the biggest sleep bandit. Participants who slept with their pets averaged almost two wake-ups a night – 72 percent more wake-ups than those who slept alone (1.15). 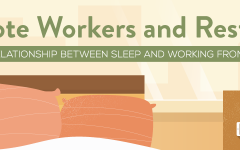 Those who slept with a partner averaged 1.23 wake-ups per night, while the overall average was 1.43 wake-ups. According to experts, it’s common for adult sleepers to wake in the night. They can wake as many as four times or more. It’s possible, however, that these dreamers just don’t remember the missing winks. Most men and women surveyed share their beds. Who is responsible for stirring them from their sleep? First, let’s see who is sleeping with whom. About 68 percent of women sleep with a partner, while others sleep with their pets (32 percent), children (11 percent), or alone (23 percent). Around 54 percent of men share their bed with a partner, while 19 percent sleep with their pets and 4 percent with their children. Additionally, 42 percent of men sleep alone. What wakes up women the most? Almost 60 percent indicated having to use the bathroom as the main reason for dragging themselves out of bed. At the same time, 45 percent said their partners wake them up. 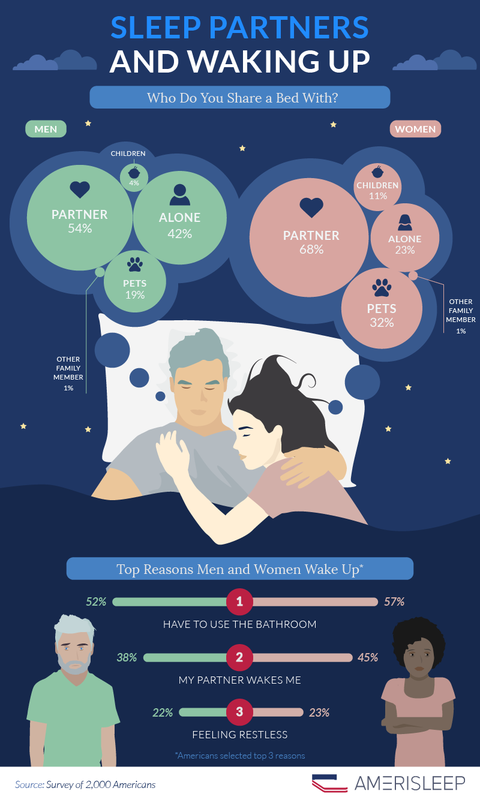 Men also wake most frequently to use the bathroom (52 percent), while 38 percent said their partner wakes them up; 22 percent simply feel restless. Are You Guilty of These Sleep Habits? From stealing covers to sending their bedtime guests to the floorboards, our survey participants admitted to their nighttime habits. What are they most guilty of? And are men or women more to blame? In a list of top 10 bedtime practices, men and women are guilty of a wide range of sleep habits. Many (67 percent) are guilty of tossing and turning, and almost half (47 percent) admit to snoring. Blanket stealers make up about 42 percent of those surveyed. 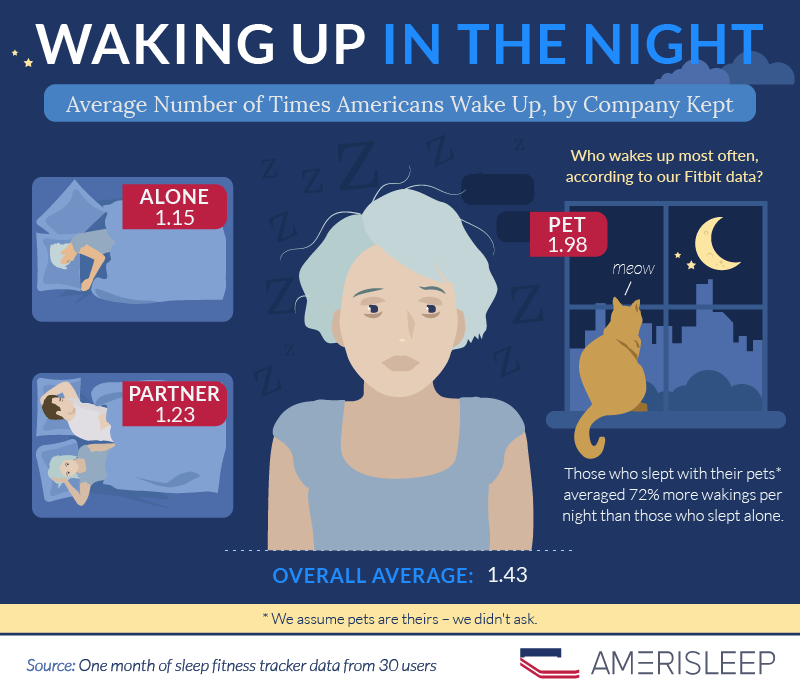 Luckily, most Americans in our study don’t push their sleep partners off the bed; however, 6 percent must really like their space. Additionally, 55 percent of women admitted to stealing blankets, while 39 percent snore, 35 percent drool, and 30 percent sweat. Alongside tossing and turning, men are most guilty of sawing logs, with 54 percent confessing they snore. Around 35 percent sweat, 32 percent drool, and 30 percent steal the blankets. What Wakes You Up in the Night? With all these sleep disturbances, you would think those who fly solo have it good. 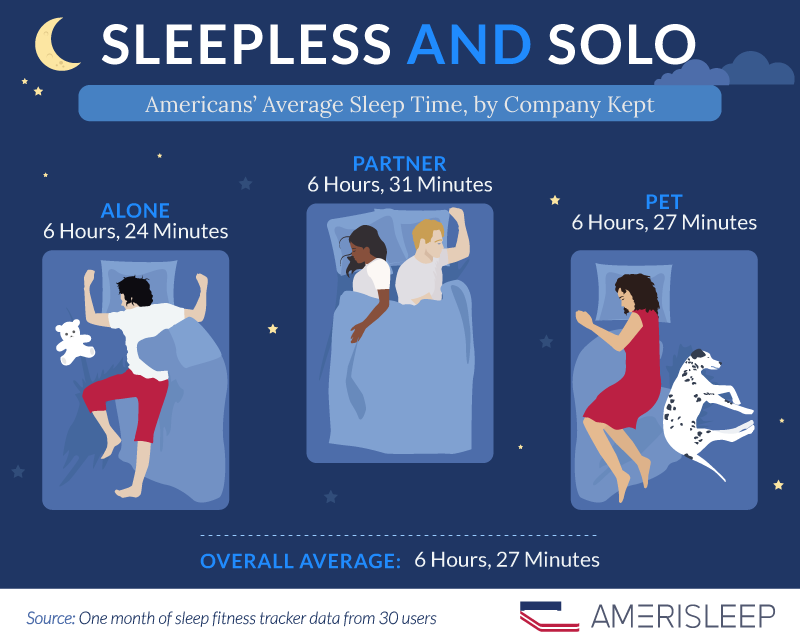 Although they sleep through the night more often than those who share their sleep space, Americans who sleep alone still deal with disturbances. The biggest reason solo sleepers and co-sleepers wake in the middle of the night is to use the bathroom. However, co-sleepers must also deal with their partner waking them (41 percent), while those who sleep alone face restlessness (28 percent). As well, 12 percent of participants who sleep alone said their phone wakes them. 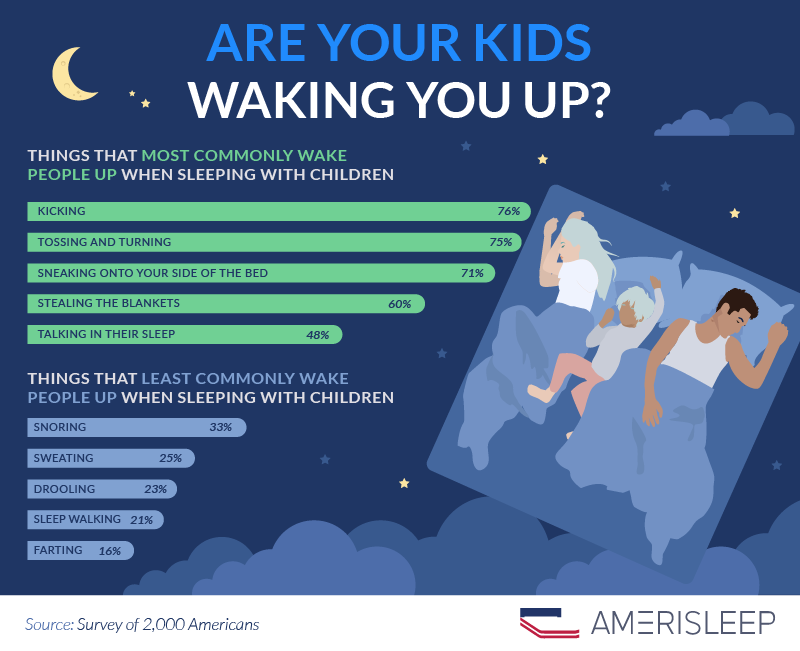 Most of our surveyed Americans wake one to two times during the night. Notably, though, 23 percent of those who sleep alone make it through the night without ever waking, while only 14 percent of people who share the bed with a partner sleep do the same. Only about 1 percent of all respondents wake more than six times. 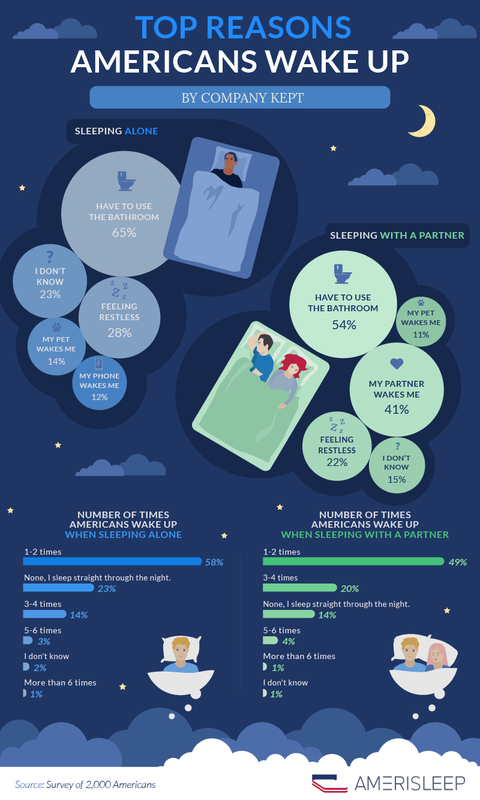 Do Americans Find Comfort Sleeping With a Partner? Apparently, sharing is caring when it comes to sleep. Over 60 percent of women and 57 percent of men find sharing a bed with a partner to be comfortable. On the other hand, 23 percent of men and 21 percent of women said it’s anything but, while 20 percent of men and 16 of women said it doesn’t make a difference. We were also curious to find out if bed sizes influence whether participants find co-sleeping to be comfortable. 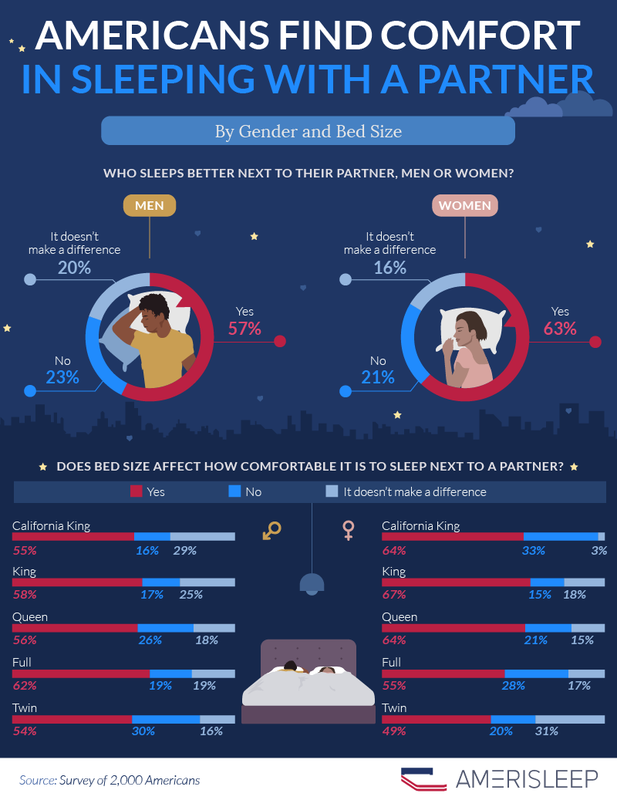 More than 50 percent of men in each bed-size category said sleeping with a partner was comfortable regardless size – even in the close quarters of a twin bed. Still, men weren’t as thrilled about sharing a twin. The greatest percentage of men, compared with other categories, said no to snuggling on this small mattress. Over 50 percent of women said sharing a bed was comfortable except when sleeping on a twin (49 percent). Despite the ample space, the largest number of women who found co-sleeping to be uncomfortable felt so on a California King bed. Sleeping With Children: Comfort or Chaos? Sorry kiddos, but it looks like mom and dad aren’t too fond of those late-night sleepovers. Most men and women agreed sharing the bed with children was not comfortable. Men felt more strongly about this with 54 percent against co-sleeping compared to 43 percent of women. 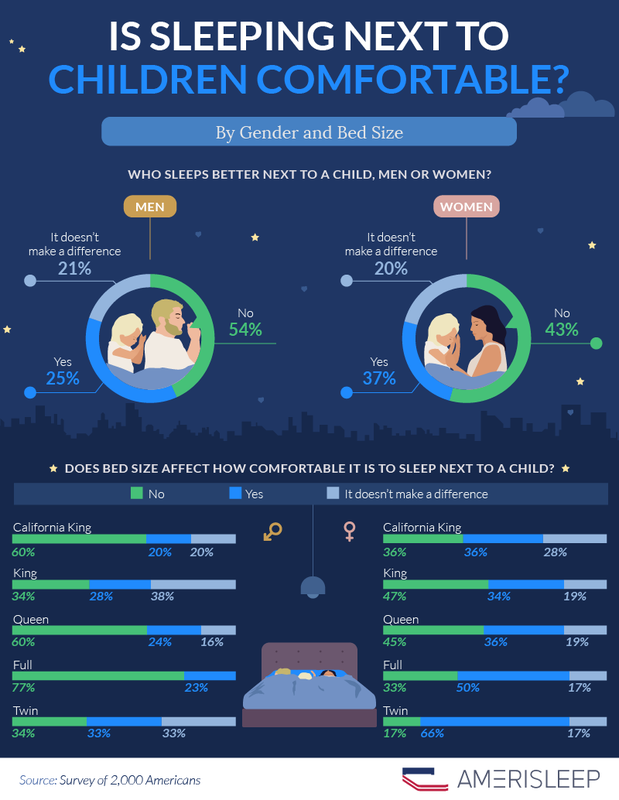 Across the board, more men said sleeping with children was not comfortable in any size bed. About 37 percent of women said sleeping with their kids was comfortable compared with 25 percent of men. Over 65 percent of women believe the closer, the better – they said sharing the bed with their children was comfortable even in a twin-sized bed. Most women, however, did not consider it comfortable in a king-sized bed; many men did not consider it to be comfortable in a full-sized bed. Do Kids Kill Your Sleep? What makes parents think sleeping with their little ones is anything but precious? It turns out, those surprisingly strong kid kicks are the chart-topping reason why participants (76 percent) wake during the night. Tossing and turning is a close second, which wakes up about 75 percent of people who share their bed with children. Other reasons include children sneaking onto their side of the bed (71 percent), stealing blankets (60 percent), and talking in their sleep (48 percent). The things children do that people are most likely to sleep through include snoring (33 percent), sweating (25 percent), drooling (23 percent), sleepwalking (21 percent), and farting (16 percent). Whether you sleep alone or with a partner, child, or pet, a comfortable mattress is an important part of getting a good night’s rest. Amerisleep can help you find the perfect mattress to accommodate all your sleeping habits and needs. Visit us online today. We gathered one month of Fitbit data from 30 people. 10 people slept alone, 10 people with a partner, and 10 people with a pet. Additionally, we surveyed 2,000 people in the U.S.
Rest easy knowing that we grant permission for you to share the images found here in your publication. Just don’t sleep through the alarm: We request that you link back to this page to give the authors proper credit. Counting Sheep and Losing Sleep? 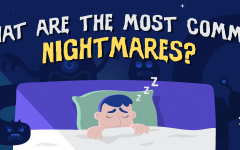 What are the Most Common Nightmares?